I first saw “Diggstown” in a theater, which means I saw it in 1992 after returning from the recently-collapsed USSR. In Cincinnati. I immediately tagged it as classic, passed it onto my sons, more avid movie-goers who concurred. But I didn’t go to see James Wood. I had always loved Bruce Dern (the heavy inn this film) and Lou Gossett, Jr.
Of course, today James Wood is a star of conservatism and Twitter, on almost as many most-hated lists as Donald Trump. Even Sara. Good company, all. But a film like “Diggstown” you don’t care about anyone’s politics. Besides GHW Bush was still in the White House, the early bets on the peace dividend were only just being wagered, the Clintons still in Arkansas, and Monica Lewinsky was just graduating from high school. The coming onslaught on American morals were still a year or two in the making. For many in the Baby Boomer generation (I’m 72) the Clinton regime was a genuine crucible, for we all had to confront dozens of inconsistencies (actually, tugs of war) in our own belief systems, that had been nagging at us since the Vietnam War…from basic morality, true good and evil, to the true nature of American exceptionalism, and where it resided and did not (that study continues) in American society. A law class ahead of Bill Clinton, we all recognized his type easily from that period…some admired it, others not so much. Wikipedia tells us that the Clinton changed James Wood’s politics entirely. I just know, fresh from three months in the USSR and spending almost all that time with regular people (a passion of mine which I write about often) and the hopefulness in their words and eyes that America would come make their passage to freedom better, that a second term of George HW Bush would be a good thing. We had so much more to offer the new Russia than the West Europeans, who looked down on them in a condescending, red-headed step child way, same way they do Donald Trump today. Clinton changed all that, an unbelievable opportunity lost, resulting in oligarchic fascism instead of democracy, ruling modern Russia. So it wouldn’t have mattered that the entire crew of “Diggstown” were liberal in 1992. Bill Clinton changed a lot of minds, and for an awful lot of different reasons. 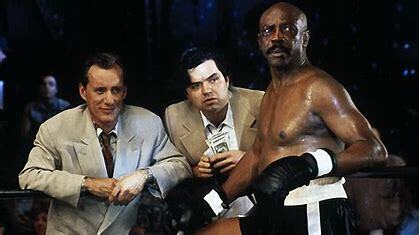 If you don’t know the story, “Diggstown” is a stand-alone classic, a con-man who started out just trying to out-con another con-man just to cover some old debts to criminal loan sharks, and ending up bringing down an entire empire of evil in one small town…almost all in the confines of a 20″ square boxing ring where one man, Honey Roy Palmer, (Gossett) would have to beat the 1o best fighters in the county, all with a 24-hour period. .
Last night was perhaps the 5th time I’d seen the film fully, and every time, new comparisons popped into my mind, e.g., that Harry Reid reminded me of Bruce Dern’s character, and I swear, the prison warden who was also in Bruce Dern’s pocket, was a spitting image of Jeff Flake. Perfect casting. Whudda thunk it then? See if you can pick on those kinds of comparisons. I’ve included a 3-minute trailer here, you can rent for as little as $2.99 on video after jumping through some hoops. Next post The Two Faces of the Deep State and "the People"